Cardiff City boss Neil Warnock says he is is not getting carried away with his team's position in the Championship. The Bluebirds are second and can cut Wolves' lead to two points if they beat Reading on Monday evening. But the experienced Warnock says he is keeping his own feet and those of the players on the ground. "I'm not trying to play it down, I've just been around a bit longer than you guys and I know how quickly things change," he told a press conference. "We haven't got a group of lads who get carried away. "I think they're enjoying it, and quite rightly so when you look at the size of the teams below us and the money they've spent and their budgets. I think we should take our hat off to the players. "I think they've done remarkably well and we're going to try and stay there as long as we can and then see how the second half [of the season] pans out." Warnock's side have achieved their league position with four consecutive wins, and in spite of long-term injuries to key forwards Kenneth Zohore and Nathanial Mendez-Laing. By contrast Reading - beaten on penalties by Huddersfield in the play-off final last season - have struggled to regain the form that saw them finish third in the 2016-17 table. "I thought they should have gone up last season really," said Warnock. "When you look at the results they'll kick themselves for not beating Huddersfield really, to see Huddersfield going up was probably a big blow and I've been in that situation after losing the play-off. It's difficult. "They've got some really good players and it's a great challenge for us. No one expects us to beat these teams and yet we are enjoying it. "We've got to have a plan you know, we can't just go out willy-nilly because Reading pass every team they play off the park - they have 60-70% possession even against the top teams so we know what's coming and hope we can put a game plan for the right result." 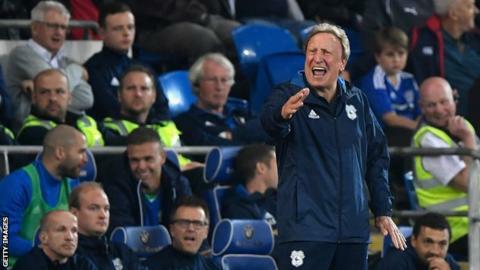 Warnock's second season in charge of Cardiff has been in stark contrast to last term, when he was faced with dragging the club out of the relegation places and to mid-table safety. For that reason he says there is no pressure on him or his team. "I don't see pressure where I am now compared with last year and the year before at Rotherham," he added. "I think there's much more pressure trying to save a club from relegation. I think we've got to enjoy the moment here, we've got good players and fans that believe in us as well - it's just a great place to be at the moment."